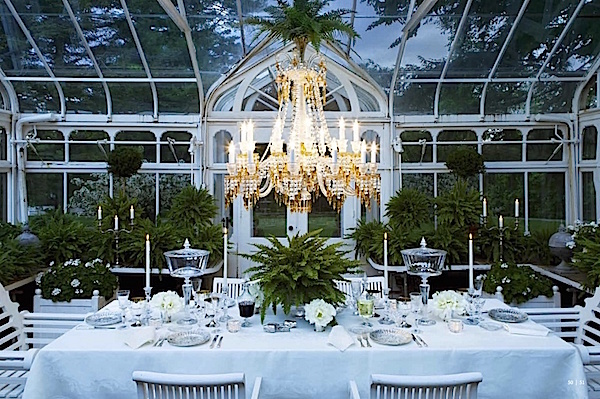 In our video with Carolyne Roehm at her beautiful Connecticut home, you may remember one moment showing a spectacular crystal chandelier hanging in the greenhouse, below. 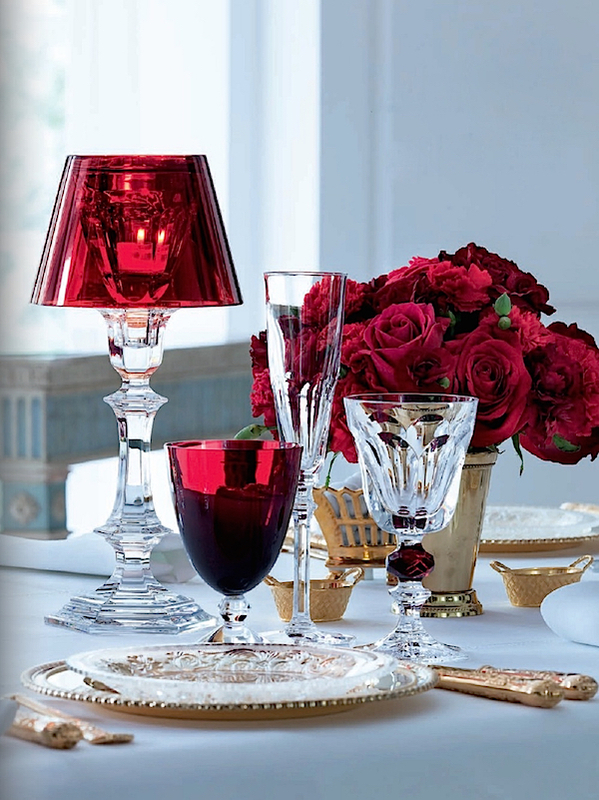 From a shoot at Weatherstone, the image is from a catalogue that Carolyne styled for Baccarat holiday. 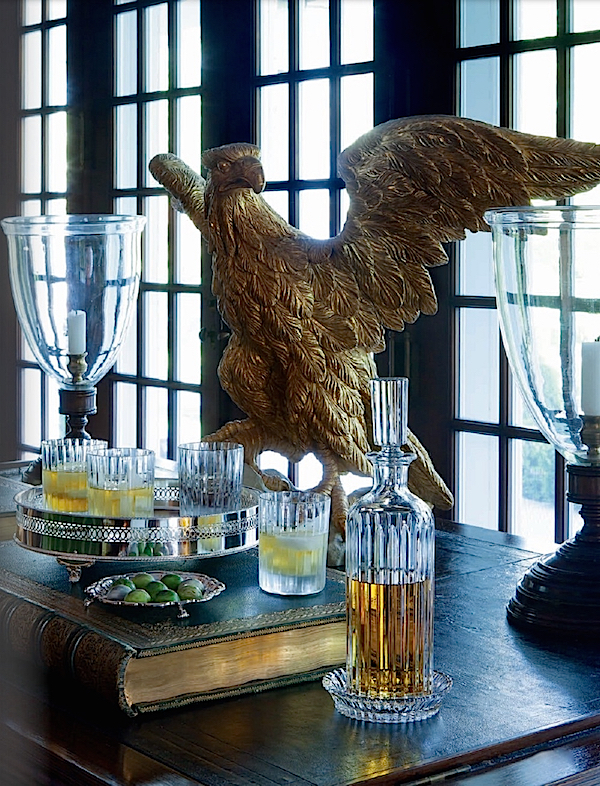 Throughout the book are exquisite vignettes that show both Weatherstone and Baccarat at their glimmering finest. 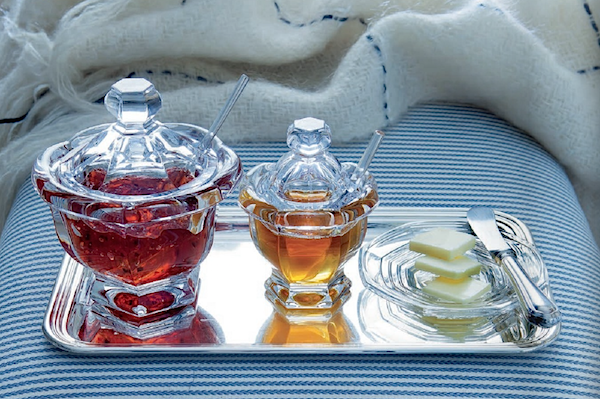 As we all prepare to think about the holidays, both in terms of tabletop, gifting and decor, these pages offer an elegant vision of “La Vie en Baccarat” chez Weatherstone. 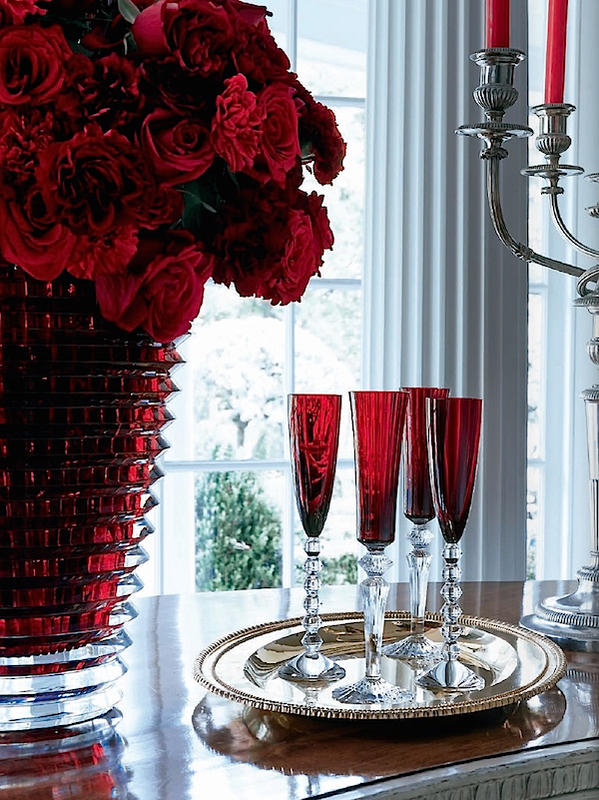 Baccarat’s signature red looks regal and festive for a holiday table. Above, the shade on the Harcourt candlestick by Philippe Starck and small Véga glass as well as champagne flutes with large Eye vase, below, echo the beautiful roses. 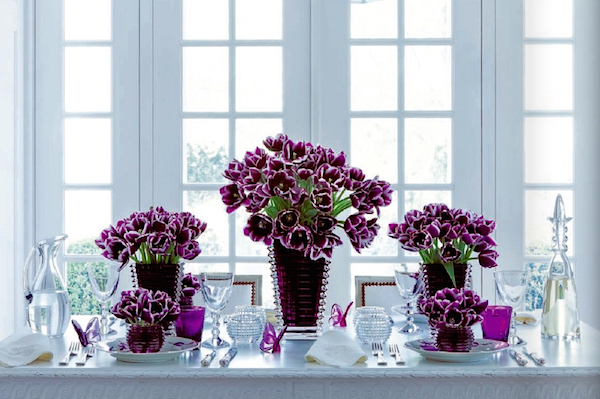 I am loving plum and violet colors this year for my Thanksgiving table, which look glorious executed by Carolyne here. I wish I had known about the charming small Eye votives and Mosaique tumblers in amethyst. My favorite Harmonie bar glasses are always a classic choice. 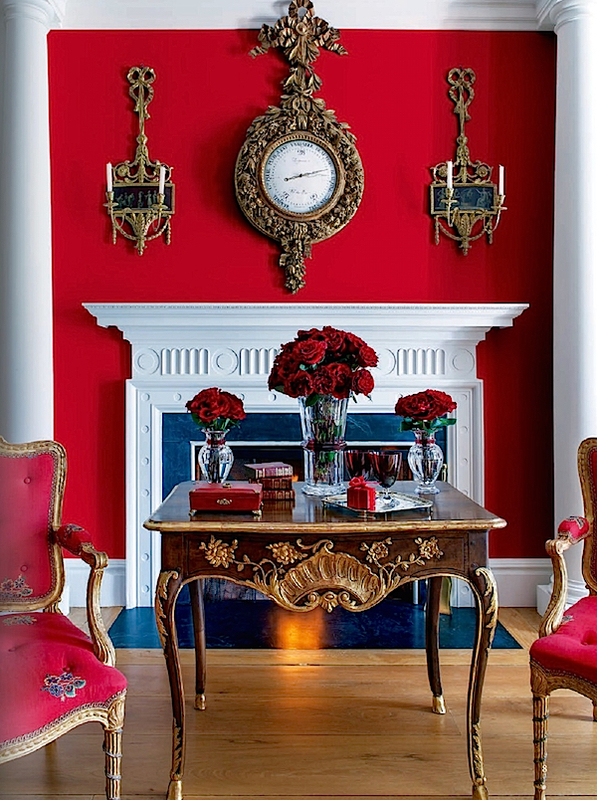 where a touch of red is also symbolic of heartfelt time spent with family and friends. This entry posted in design, gifts, holiday, interior design. 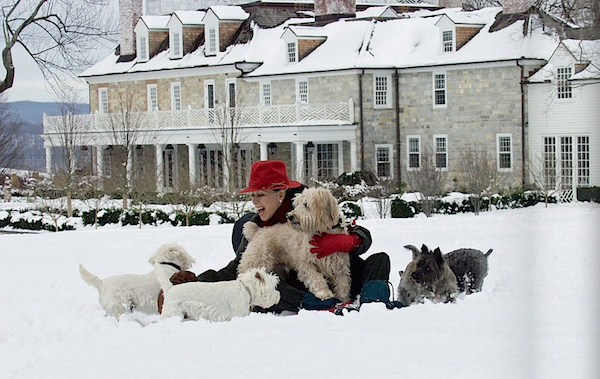 Entry Tags: Baccarat, Carolyne Roehm, Crystal, Holiday decorating, Tabletop, Weatherstone Bookmark the permalink. Baccarat Crystal, always timeless and classic, I love the reds; the amethyst is gorgeous though! Using Baccarat in the conservatory is brilliant. I love every photograph. Carolyne lives so graciously. It’s making me want to rethink how I go about my daily life. Thank you for the inspiration! Happy Thanksgiving! Those reds though O_O stunning. This was beautiful. I truly enjoyed it! What an inspiration. The adage “A thing of beauty is a joy forever ” absolutely applies here. Pure visual feast. The first buds of spring,a single feather on a dew soaked lawn, full blown roses. I could go on forever. I am always astonished at how so many people see so little. There is beauty and joy around every corner.Fresh linen on a sunny day, a pot of wonderful orange jelly waiting for crepes and lemon curd waiting for a delicious warm cake to be shared with friends. Sharing is everything. I am so , so fortunate to have a friend of 55 years and though we live hundreds of miles apart, we travel together and share everything. This is a truly unique friendship, searching out beautiful china, glassware, and truly appreciating the joy of gardens , architecture, food and travel. I am blessed. 81 queries in 0.449 seconds.